Because of Valentine’s day, many people celebrate love in February. We wanted to highlight and celebrate friendship! Everyone should have friends who love them, because friends make life rich! We’ve asked some of our staff and clients to reach out and share about their friends! 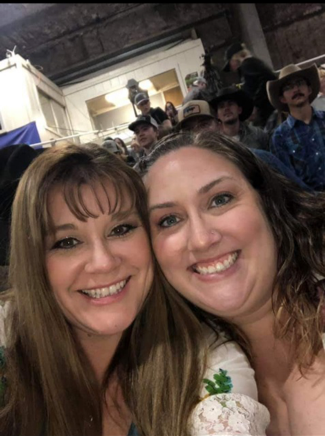 In this blog, Julie shares about her friend Zandee! The dictionary defines loyal as “giving or showing firm and constant support or allegiance to a person or institution.” I believe that it is possible to have loyal friends at work. Work friends understand the things that you deal with on a day to day basis. Work friends support you in the good days, and they support you on your bad days. No matter what, they are always there to lend a hand, a smile, or a shoulder. I believe loyal friends from work can become friends who participate in other aspects of life besides work. Loyal friends aren’t afraid to tell you the areas where you’re succeeding, and they’re not afraid to call you out in areas where you’re not making the best choices. To me, this means that I am not alone. Working in the field that we are in, sometimes it’s easy to isolate yourself because we are with people all the time. Having someone who knows what that’s like is a huge plus! This means that someone else has “been there” and has walked through the hard times. You have someone in your court. A loyal friend is just a text message away. At the end of the day, a loyal friend can set aside all the drama of the day and you can go out and just be friends. You don’t need to talk about work at all, you can just be. You can do fun things together like going to the rodeo, going out for dinner, or just heading to their house to enjoy each other’s company and laugh until you cry. Having a loyal friend at work makes going to work a lot more enjoyable. This is my dear friend Zandee. I am so blessed to have her in my court. She’s fun, crazy, smart, and loyal. We laugh so hard together. She’s not afraid to laugh with me or tell me how it is. She’s not afraid of my mess and is willing to sit with me during hard times. She keeps me sane! She’s the best! Do you have a friend at work who helps you? Share your story in the comments below!